Perhaps a bit off topic for a KM forum but I still think that Hazel fits the ‘automation’ bill quite well. One thing that I am curious though is whether anyone here is using it or perhaps tried using it? Is it worth it? This forum has a lot of smart individuals and I would love to hear your opinion on it. I am also really curious how you guys manage your files? And don’t really have any file automation in place. I organise all my media with Pixave, all my writing with Ulysses and personal photos in Photos. The rest are just various pdf’s and files and code that I am starting to write. I am learning quite a lot about linux and unix and am fascinated by the idea that everything in unix is essentially a file, even a process is a file you can inspect. Would love to hear how you guys organise your files. Thank you for sharing. anyone here is using it or perhaps tried using it? Is it worth it? Of course, Hazel is absolutely great. It’s the grandmaster of folder watching. (This corresponds to KM’s “Folder Trigger” or macOS’ “Folder Actions”.) It has very fine-grained trigger options and file actions. It also has a special and very neat “Trash watching functionality”. I’ve set it to delete files older than 3 months from the Trash, and since then I’ve never emptied the Trash manually. So you use that, instead of something like this, which you wrote? By the way, I have to say that the above macro is a thing of beauty. Love the help text, never would have thought to do it like that, yet it’s so obvious. Love the “Dry Run” feature. Awesome! LOL, you are right. I still use my macro sometimes for emptying the Trash of external disks. But the “regular” Trash (startup volume) is in hands of Hazel. Many of my best ideas are “inspired”. Yeah, I like that. “Inspired”. It’s not stealing, it’s an homage. Just like “Ice Ice Baby” was an “homage” to “Under Pressure”. OK, maybe I went too far there. LOL. Yep, that’s a great word: Homage. I’ll use that one next time. transferring photos from one of the phones in the household.It’s a WinPhone and so photos are automatically fed to OneDrive, from where Hazel distributes them to a NAS and the OSX Photos app. I also scan everything to one folder, watched by Hazel, and again quite a lot can be filed by Hazel. I’d suggest going to the Hazel forums. There are some sophisticated rule sets which mean it’s even possible to automatically rename and file (say) scanned bank statements based on bank name and date. I cannot recommend both KM and Hazel enough! Both make my life so much more productive on the Mac. Hazel is a folder watcher. It just sits there and watches a folder. 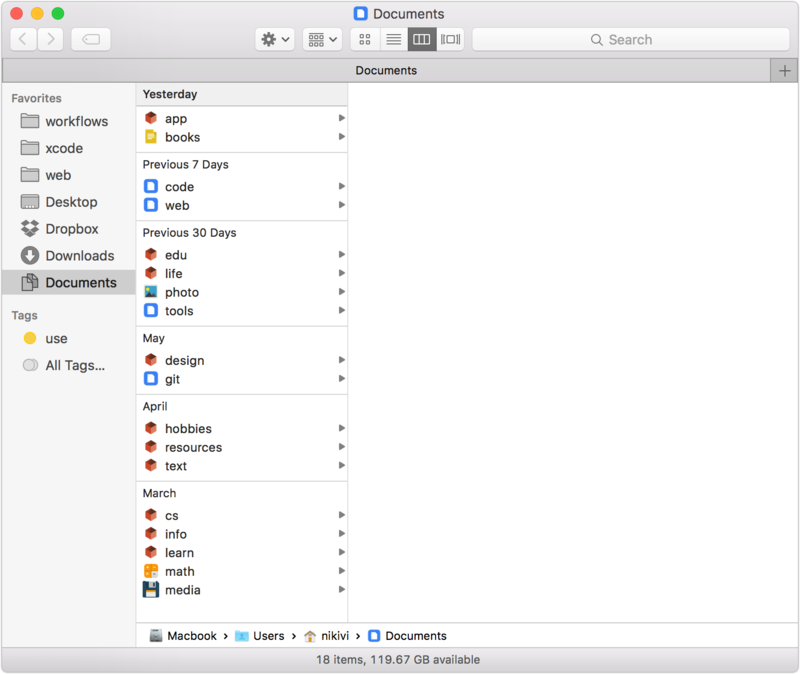 If something changes in the folder you can define rules to make it do something. For example, point it at your Downloads folder and then make it move/tag/rename a pdf file to another folder. It can look in a file, find a string (“gas company”) and then move/tag/rename it to the proper folder. I have it watch my Client folder and if and if a file is changed/added in any of the subfolders, then Hazel will automatically copy it to my Synology (in the proper folder). It can organize your photos. I have a Hazel watched folder that if a file is added, it will open Evernote, copy the file to a certain notebook, then moves the file to an “archive for a couple days” folder. Then after a couple of days, Hazel assumes I don’t need the file and deletes it. It’s very helpful. I use Hazel for many things. But, the most important of them is managing and processing PDF files. I spend most of my days working on PDF files (I am doing my phd). This is really interesting. Automating some of my pdf downloads would be nice indeed. I am curious what kind of scripts you use to ‘cleanup the metadata’ if you don’t mind sharing? The embedding of the metadata is done by standard shell script in combination with exiftool; another potent metadata manipulation tool widely used for archiving photographs (media files). It also works well with PDF files. exiftool -Author="$author" -Title="$title" -CreateDate="$year" "$1"
blank_data is a tag I use to mark PDF files which contain no metadata. 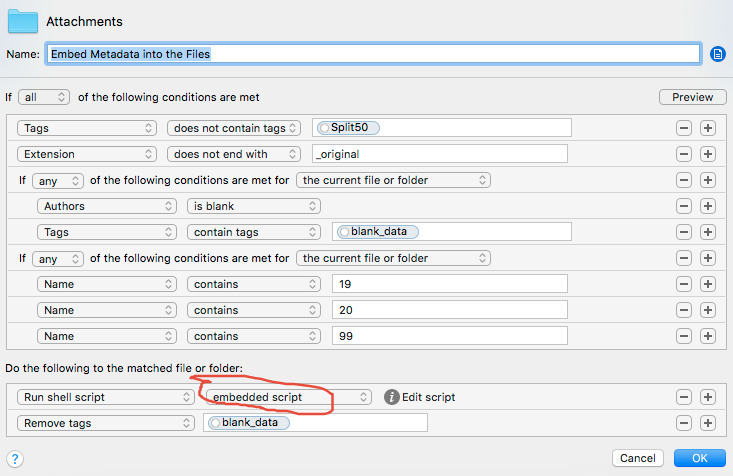 For files which contain a good metadata, there is no need to overwrite them. How do I know which of the files have blank metadata? I made Hazel to inspect the files. It inspects them and tag them with blank_data, before running the above rule. I push everything possible to my A-Z Finder folders that reside in iCloud. Hazel watches the Desktop for emails I drag onto it (which is every email I get and which action KM does for me with a click) to auto-file ones I've identified usually using Hazel's "Content" + "content match" conditions which reads emails well. I have a current month folder that Hazel moves many emails to for most monthly expenses I get notified via email. Hazel also watches dozens of FileThis (FileThis automatically downloads your digital statements) folders to move their contents to the correct A-Z file. Hazel moves anything that downloads to my Downloads folder to the desktop which the Desktop rules then handles. This eliminates the Downloads folder as yet another place for things to get lost in or needs to be addressed. As @nikivi to @MitchellModel in the long and great "MACRO: [KMFAM] Favorite Actions and Macros" posting by @DanThomas said in part "...optimising my personal workflow is kind of like a hobby." and one I greatly enjoy at the moment. Anyway, I use Hazel to move AND tag as unread ("unread" being a MacOS tag I made) emails from a political mailing list that I keep meaning to read but likely am just fooling myself about and will probably just delete on mass when I get straight about it The neat part is that these email come in various formats, yet, Hazel allows as many and varied conditions to cover anything they send. Hello @Desalegn, could you please guide me to how you do this? I've been searching for ages (for my huge PDF collection) and just reading through your process I see it's possible. @Dave_H To use contents in Hazel you need a searchable PDF. With my ScanSnap I can make that. PDFpen has also an option to make them searchable. If it is not searcheable I don't think it will work. 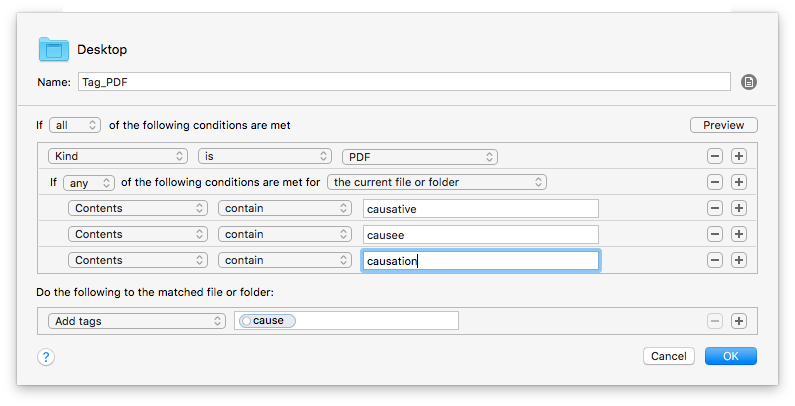 The problem with this approach is that it tags a lot of documents that are not directly relevant to "causation". There would be a lot of false positives. A useful development would be to search the terms only within the "keywords" section of the document. I didn't find any script of that kind. Another approach that quite fairly minimized the false positives was to restrict the search to the first 2-3 pages of the document. The page counting requires some additional scripts.